That much is true. But depending on our circumstances our year most probably did not start as it means to go on. In fact 1 January for many was very much a date still buried inside the seasonal holiday period. We might have been away from home, or about to leave the place we call home. And people staying with us may not have left for their homes. Schools started a few days later. And universities even later. Clubs may still not have re-started. After a few weeks, life will feel more predictable. Which may or may not be a good thing. But then when the next interruption comes along, perhaps the Easter break or the summer holidays or something less expected like a change in personal circumstances, we reach an ending. The sequence of beginning, middle and end is something we take for granted but perhaps don’t think about much. Beginnings can feel awkward, scary or slow. Middles can feel intense or, conversely, dull. Endings might bring relief or sadness. This much is true for even short encounters. Meeting someone might start and end with pleasantries, probably well-rehearsed. We work our way in to the encounter and when it’s time, we work our way out of it again. A job interview is especially like this. The purpose of the beginning is more than a ritualistic exchange of observations about the weather and asking questions about someone’s health to which they must reply politely. It’s also a chance to feel our way into the world of the other person, or people. Very quickly we will have decided, perhaps unconsciously, what we will disclose in the conversation. Equally, what we might like to know from the other person. It’s a bit of a game, but it works. Kind of. A single counselling session tends to follow the wave pattern. The first few minutes are unlikely to feel like the most intense, because both counsellor and client are (re-)establishing contact with each other. Sometimes it might feel that the whole session never really gets past this apparently superficial stage. Other times the emotional journey moves quickly into a place where both parties engage therapeutically. Many people in counselling have weekly sessions, and the wave pattern also applies to the whole period during which they are in therapy. The first session can feel like a “getting to know you” session, and the final session is unlikely to address any new material. More like a sharing of what it’s like to end and perhaps never see each other again. Parting need not be sad, but avoiding a last session deprives the client of a therapeutic experience of an ending, and the learning that goes with it. This describes the beginning to middle process. Obviously everyone will experience the process differently. But my point is that whatever starting out might feel like for you, your counsellor will accept you whatever state you are in. The counsellor will likely observe and offer back what they experience of you (nervous, guarded, excited etc). What happens next cannot be predicted in advance, and depends on how the therapeutic relationship develops. There is often anxiety about beginning something involving others. We don’t want to feel embarrassed or foolish. We don’t know what will happen, nor if we can cope with it. Even the confident among us might recognise how easy it is to use confidence as a defence. 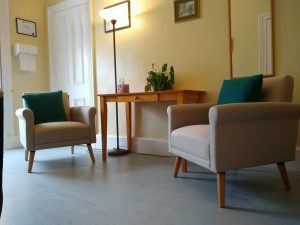 My advice to anyone contemplating counselling but is put off from starting out is not so much to ask themselves whether they can tolerate sitting with a counsellor for 50 minutes. Rather, is there something that they can learn about themselves from the experience of sitting with a counsellor for 50 minutes? This openness to learning (or growing as many texts put it) is key to the process, and the starting out is part of that learning. I am a counsellor practising within Eyre Place Osteopathic Practice on Tuesday and Thursday. Please contact me here or book a session with me on the practice’s online booking page.